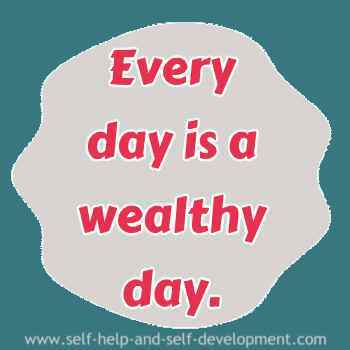 Affirmations for Wealth welcomes you. 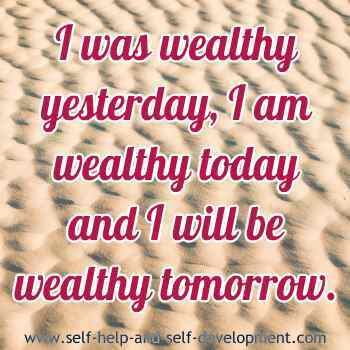 Affirm your way to wealth using the following excellent wealth affirmations. Change your thinking and attract wealth to you. We can achieve almost anything when our subconscious thoughts match our conscious thoughts. Only consciously thinking about wealth will not attract wealth if subconsciously we are opposing wealth or are afraid of wealth at some level. Repeating affirmations helps change the subconscious thought pattern. Sometimes there may be some obstacles to overcome, like releasing some issues about money. But affirmations is the easiest way to reprogram the subconscious. 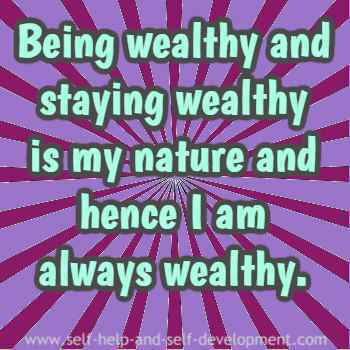 Affirmations for wealth will reprogram your mind about wealth. You may combine one or more of the following affirmations for wealth. Repeat at least a hundred times during the day, preferably in front of a mirror. Keep your mind positive about wealth. I will be wealthy tomorrow. 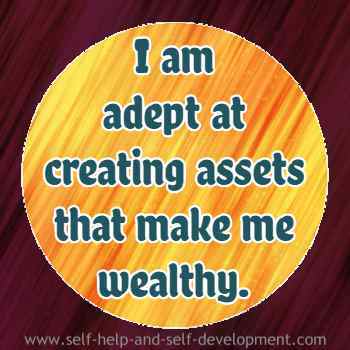 I am adept at creating assets that make me wealthy. hence I am always wealthy. 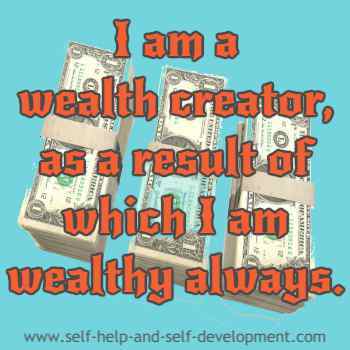 I am a wealth creator, as a result of which I am wealthy always. 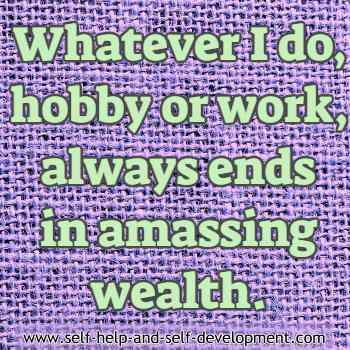 Whatever I do, hobby or work, always ends in amassing wealth. 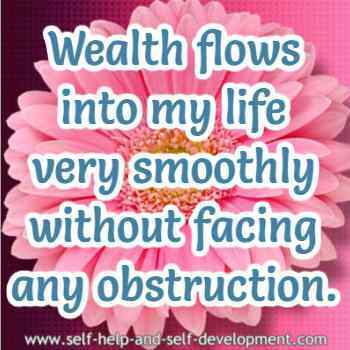 Wealth flows into my life very smoothly without facing any obstruction. I am only positive towards wealth. All my issues with wealth have disappeared. 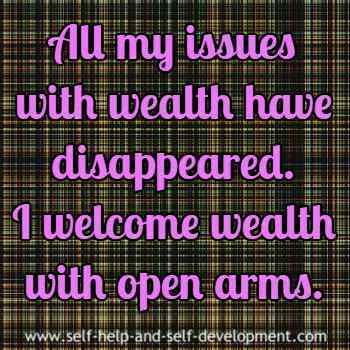 I welcome wealth with open arms. I realize that I can do a lot of charity with my wealth; hence I stay wealthy. Wealth and I are one. We are inseparable. Being wealthy gives me joy, happiness and peace of mind and I distribute all these and my wealth among the needy. Here is a very important suggestion. 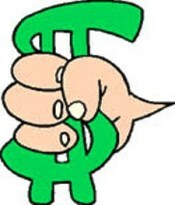 Whenever you receive any money, small amount or big, repeat your affirmation for wealth in your mind. Your salary check, dividend warrant, someone paying you for something, whatever be it, repeat your affirmation. This will help the subconscious to make a connection between your affirmation and receiving money. Once that connection is in place, becoming wealthy is not far away. 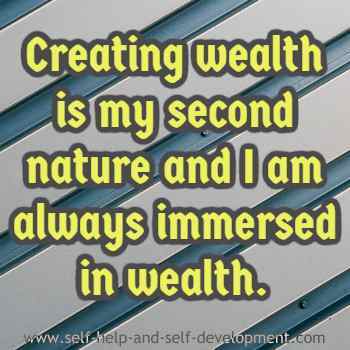 Another way of using wealth affirmations is through hypnosis CDs or MP3 downloads. As you are aware, hypnosis is a powerful way of influencing the subconscious. If, in addition to affirmations, you also listen to hypnosis CDs or MP3, once in the morning and once at night before sleeping, it will do wonders to your progress.